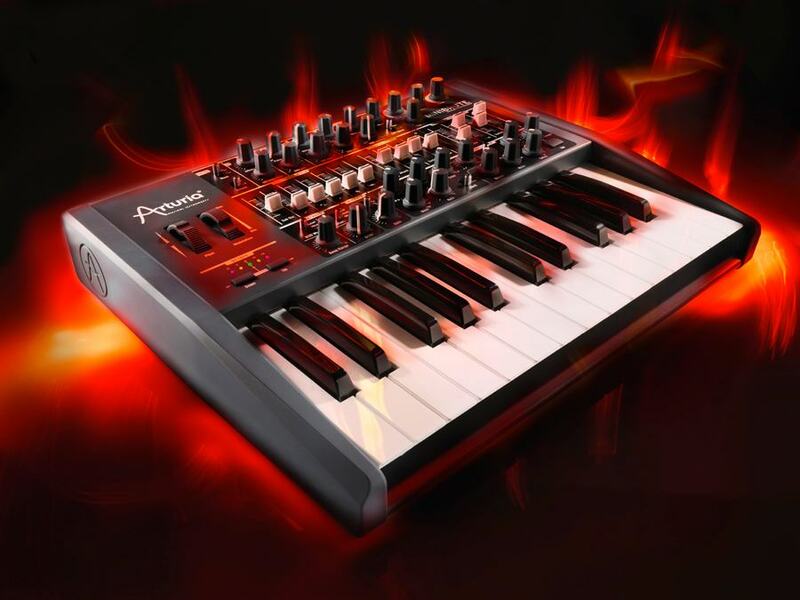 Arturia’s new Minibrute analog monosynth, from the virtual analog software company, seen here blazing away in the apocalyptic moments just before Hell freezes over. We’re calling it: on Thursday, January 19, the soft synth age, and synth polyphony, officially came to an end. Also, Arturia, the people who make virtual analog soft synths, are now making analog hardware. And I just saw Roger Linn, and he was sporting a new goatee and had an agonizer in his sash, and he’s working for Akai again but calls them the Terran Empire. So it’s possible something very odd is going on. Yes, Arturia has a “100% analog,” two oscillator synth with CV, MIDI, and USB, plus an arpeggiator. Price: US$549 / €499, April 2012. 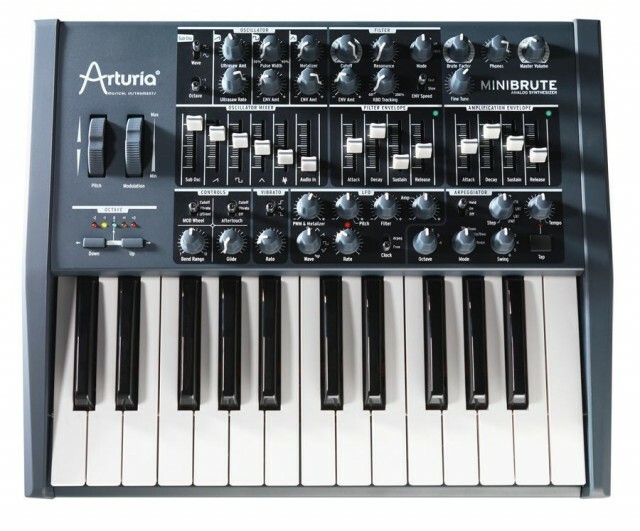 I wanted to bring something special to our coverage, so we’ll see how the Arturia Minibrute compares to the brand new 1981 Moog Rogue. The Moog Rogue has a similar form factor, and some might argue a cleaner control layout. (It’s certainly simpler and more approachable.) And like the Minibrute, the Rogue is a 2-oscillator analog synth. But there are some significant advantages of the Minibrute over the Rogue. The Rogue is limited to saw and either rectangle or square waves, and lacks the sub, triangle, and white noise sources. Both the Rogue and Minibrute work with external audio, though. The filter on the Moog is 24dB/oct lowpass, whereas the Minibrute has a multimode filter; I’m eager to hear that Steiner-Parker filter in action, but the Rogue’s filter works pretty nicely. Both do CV and gate. You get 32 keys on the Moog, which I prefer to the 25 on the Arturia, but the Moog keyboard isn’t velocity sensitive. The Arturia keys are, and add channel aftertouch. And then the Arturia starts piling on the extras: you get an arpeggiator, easy selection of how the gate is routed, some unusual effects that manipulate harmonics on the waveforms, and USB, which I’m told stands for Universal Serial Bus. I’m hoping I can connect that to my TRS-80’s RS-232 port, perhaps via an adapter. So, there you have it. I need to get some hands on time, but I think I’d probably choose the Arturia Minibrute over the Moog Rogue. What? You wanted to compare to the new Moog Minitaur, or synths by Dave Smith Instruments? Well, I don’t know that Sequential Circuits has anything at this show that comp– okay, I’ll stop. And yeah, we’ll do that more serious comparison later, but Arturia, I think you should get compared to eBay offerings, too. Sounds like a challenge. Since it’s really a single oscillator synth with blendable waveforms, I’d compare it to an SH101. Updated: Jesse Mejia makes a great argument in comments for why my somewhat glib Rogue comparison is actually reasonably apt here. (And I was really somewhat serious, amidst a pre-coffee ramble.) But among various arguments against the Rogue in favor of Roland’s SH-101, Francis Preve offers this line of thinking: “Since it’s really a single oscillator synth with blendable waveforms, I’d compare it to an SH-101.” Good point. In all seriousness, a serious comparison of vintage synths to recent monosynths sounds like a great idea. Augh, Arturia, what the heck are you doing in my bedroom? And when did my hair get that curly? Via Synthtopia, here’s Passion Pit with ProAudioStar.com on the new synth.